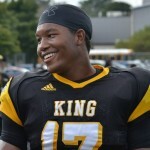 Tyriq Thompson was a one-man wrecking crew last Friday in King High’s 61-20 victory against DCP-Northwestern. As a result, the Crusaders’ 6-2, 225-pound senior has been named the Detroit Public School League Proud Strong Learner of the Week for the second time in as many seasons. On offense, Thompson carried the ball 18 times for 205 yards including touchdown runs of 75 and 25 yards. Defensively, he had a team-leading 12 tackles and returned an intercepted pass for a 35-yard TD. Thompson is one of the state’s top-ranked recruits and has verbally committed to continue his education and playing career at Michigan State University. He’s also one of the top students in his senior class. Boasting a 4.0 grade point average, he’s eager to get on to the next chapter. Both of Thompson’s parents attended King High and his father, Clarence Thompson, had an All-Big Ten career as a defensive back for the University of Michigan. That made it surprising to some when Thompson chose the Spartans over the Wolverines. A linebacker who also plays fullback and tight end, Thompson transferred to King last year after beginning his high school career in Lee’s Summit, Missouri. 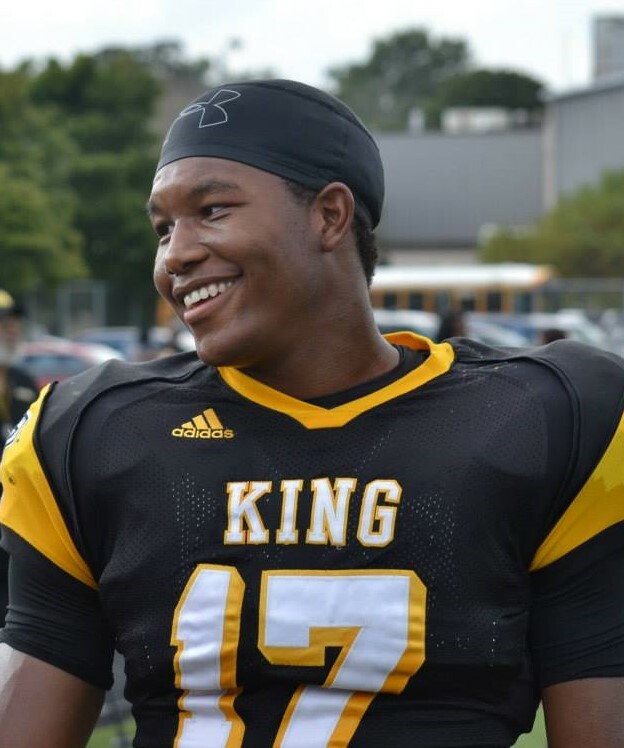 He has added about 15 pounds of muscle since his junior year and returned as one of the key players in King’s bid to win the PSL championship after losing to Cass Tech in last year’s title game. “He came to us last year as a safety, but he got into the weight room and now he’s a linebacker,” Harvel said. “He has natural instincts for the football and has the ability to play in space. A lot of players can play in a box, but they get lost in space. Tyriq can cover the tight end and wide receivers in the open field.